Michael Thomas, automotive and diesel technician, is the author of the McGraw-Hill textbook "Truck and Trailer Systems." Batteries are the heart and soul of our vehicle's electrical system. The battery stores electrical power to start the vehicle, recharges itself after power is drained, and acts as a cushion to electrical spikes in the system. Vehicles can use a single battery (cars and light-duty trucks) or four batteries (most heavy-duty trucks). With multiple batteries, one bad battery can cause the other batteries in the system to also go bad. 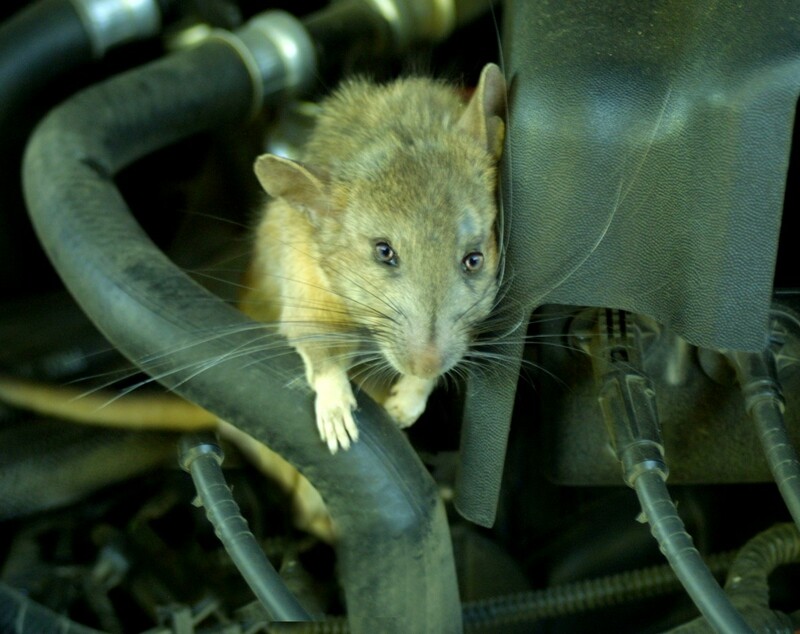 Battery problems can affect all the electrical systems on the vehicle. Also, battery cables and connections are susceptible to corrosion and cause excessive resistance that will affect battery performance. This article will cover the different types of batteries, battery cables, the charging batteries, battery testing and diagnosis, and service. A battery is technically called a galvanic device. The battery stores energy not as electrons but as chemical energy. When the battery is charged, the electrical energy is stored as chemical energy, and when discharged it turns from chemical energy to electrical energy. Lead-acid batteries are constructed with six cells, which are connected in series to produce 2.1 volts per cell, and a total of 12.6 volts when the battery is fully charged. Each cell is made up of positive and negative plates with a non-conductive separator plate in between so they won’t touch and short out. Each plate is constructed of a grid covered with lead paste: the positive plates use a paste consisting of lead peroxide or lead dioxide, and the negative plates use a paste of sponge lead. As a battery ages, some of this paste will fall off the plates and settle to the bottom of the battery. The battery will lose power and have to be replaced. The electrolyte in a lead-acid battery is a combination of sulfuric acid (H2SO4) and water: 36% acid and 64% water. This ratio should not be altered as battery performance will be affected. If the electrolyte level is low, only distilled water should be added, never electrolyte. Tap water should not be used to refill a battery because it contains minerals that conduct electricity. The three types of batteries used for vehicle cranking are: "maintenance" type, maintenance-free, and gel cell. Maintenance-type and maintenance-free batteries are lead-acid or "wet" batteries. The gel cell battery uses a thick gel for its electrolyte. These are usually the cheapest batteries. A maintenance type battery needs to have water checked and added at given intervals. As the water boils off during the charging cycle the water escapes out the vents in the caps. Fill the battery thru the cell caps. If the battery needs water fill with distilled water. Do not use tap water as it contains minerals that could affect the electrolyte. The advantage of having removable caps is that we can test individual cells. A maintenance-free type battery should not need to have water added. As the water boils off during the charging cycle, a recovery grid is located at the top of the battery cover. This will return the water back to the cells. There are no cell caps to check or fill the battery though. If the battery needs water, as seen through the opaque battery side panel, the battery needs to be replaced. These batteries contain a pressure vent to allow the battery to vent if pressure builds up in the battery. Some maintenance-free batteries use a hydrometer “eye” to indicate the battery condition. A green eye is supposed to mean the battery is good; however, the eye is in one cell only and gives no indication of the condition of the other five cells. The gel cell battery uses a special gelled electrolyte. The battery is sealed and uses special vents to hold pressure in the battery. Since this battery won’t spill, it can be mounted in almost any position. The battery is also referred to as a recombinant battery, because during charging, oxygen and hydrogen are released from the plates and form water for the electrolyte. Charging a gel cell may require a special charger because the charging rate should be kept under 14.1 volts. If that rate is exceeded, the battery will produce more hydrogen and oxygen than the electrolyte can recombine, which can cause excessive pressure in the battery. The extra gasses generated can cause the battery to bulge and be short of hydrogen and oxygen later. Gel cell batteries are usually the most expensive. They used to be twice the price of a maintenance-free battery, but the prices have come down some. When you charge a battery, the electrical energy releases the sulfate that has formed on the plates back into the electrolyte, thereby strengthening the acid solution. As a battery discharges, the sulfuric acid reacts with the lead plates and creates a sulfate layer on the lead plates. This weakens the electrolyte and battery strength. A discharged battery has little strength left in the electrolyte. When a battery becomes discharged, the layer of sulfate on the plates can harden, which makes it unable to dissolve back into the electrolyte. This is called a sulfated battery. Sulfation is usually increased by a battery that is kept undercharged. A trickle charge of about 2 to 4 amps for 40 to 100 hours may bring a sulfated battery back, but this is unlikely. 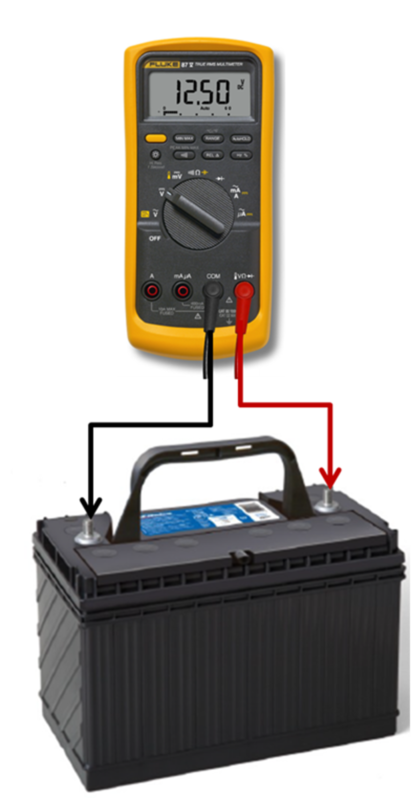 If a battery is not to be used for a length of time, it should be kept on a battery maintainer which will monitor battery voltage and charge as necessary. 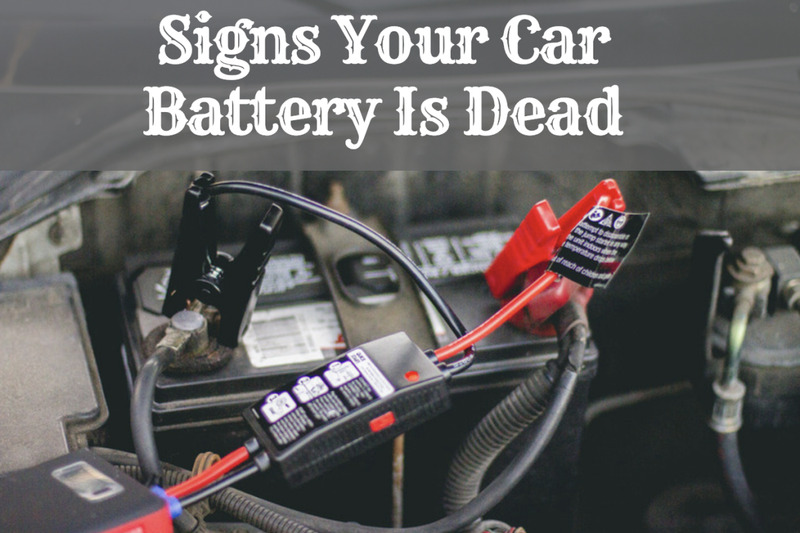 Cars, equipment, and trucks that sit for a length of time can run the batteries down. 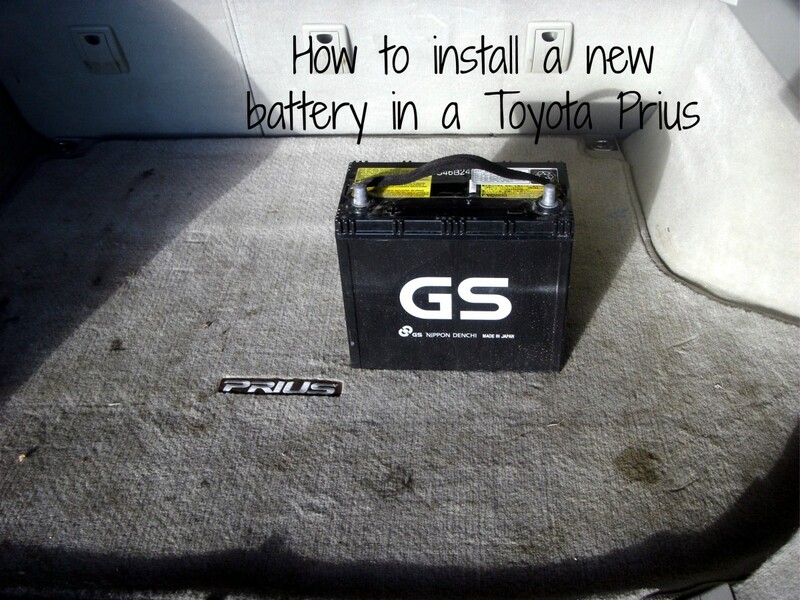 Disconnect the batteries or use a battery maintainer on them as well. Keeping the battery, terminals, and tray clean can extend the life of all the components. The Battery Council International (BCI) recommends, as a cleaning agent for batteries, terminals, and posts, baking soda and water (1 tablespoon to 1 quart). The baking soda neutralizes the acid. Do not get any of the baking soda into the battery cells as this will neutralize the cell. Use this mixture on the battery, cables, connections, and the battery tray. Flush the area with water. Dry the battery with a paper towel. Never blow dry with an air gun as this can cause a siphon effect to draw acid out of the battery. Good results show 960 Amps from a 950 CCA battery. Marginal (weak) results show 830 Amps from a 950CCA battery. Since the battery is the heart of the vehicle electrical system, many electrical problems turn out to be caused by battery problems. The following tests give the technician an accurate picture of the condition of the battery and connections. A visual inspection of the battery connections, battery tray and the battery itself should be done before any other testing is done. Battery cables that look puffed up due to acid inside the cables. 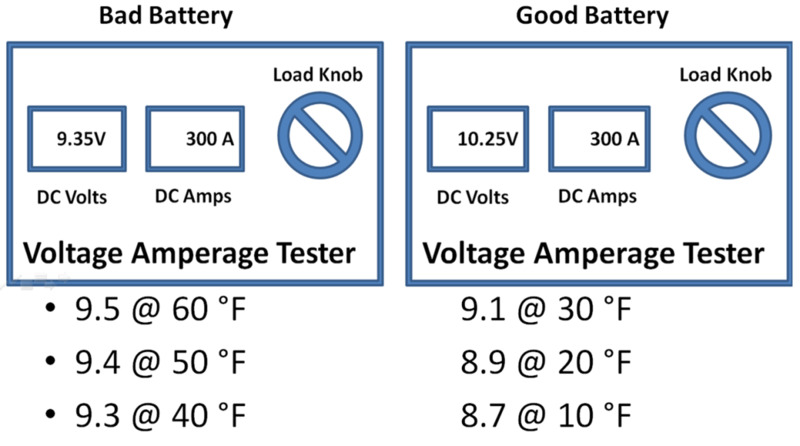 Relatively new to the battery testing industry is a tester called a capacitance or a conductance tester. This tester is the size of a voltmeter and does not put a load on the battery. It is the tester recommended today by most of battery manufacturers. The tester can test the battery in a matter of seconds for CCA (cold cranking amps), battery voltage, state of charge, and shorts or opens. In most cases the battery does not have to be at 75% to continue with the test. Make sure the tester being used matches or exceeds the CCA rating of the battery. Install adapters to stud type terminals to get a good connection. Bad connections will give false readings. Hook up the two leads of the tester, positive to positive and negative to negative. Polarity is very important. Put in the CCA rating of the battery. From tester to tester the screens vary and some use LED’s to indicate the battery condition, but they all give the following information. Actual CCA’s in the battery. Whether to replace the battery. Whether to charge the battery and retest. A good battery will have a CCA close to what the battery is rated. A weak or marginal battery will have the CCA above the failure point but below the CCA rating. If the battery fails the test, check your connections and retest. If the battery fails again, replace the battery. Remove the tester when you are done testing. Note: In a four-battery pack, the weakest battery will draw down the other batteries to its level. All 4 batteries should be at the same level. The specific gravity tests measures the weight of the electrolyte in comparison to water. The electrolyte is heavier than water so its specific gravity is higher than water. Water has a specific gravity of 1.000, full-strength sulfuric acid has a specific gravity of 1.835, and electrolyte in a fully charged battery cell has a specific gravity of 1.265. If all the battery cells are good and 100% charged, all six cells will be at 1.265. A hydrometer or refractometer can be used to check for specific gravity. This test can only be done on maintenance type batteries because access is needed to the electrolyte, and maintenance-free or gel cell batteries have no access to their electrolyte. A hydrometer works like a turkey baster. Insert the short tube into the electrolyte, squeeze the bulb and bring the level up into the cylinder to the full line. Read the floating gauge and record your reading. Squeeze the electrolyte back into the cell it was removed from and proceed to the next cell. A refractometer is similar to looking thru a spyglass. Place a drop of electrolyte on the window and close the glass cover. Look thru the viewer in a good light source and notice the shadow line formed. Read the scale indicating electrolyte. Record your reading. Note: All cells should have a specific gravity within .050 of each other. With maintenance-free and gel cell batteries the only way to check the state of charge of the battery is by measuring the voltage. Disconnect the battery to be tested from the vehicle and other batteries. If the battery has just been charged or the vehicle driven, the surface charge needs to be removed before testing. 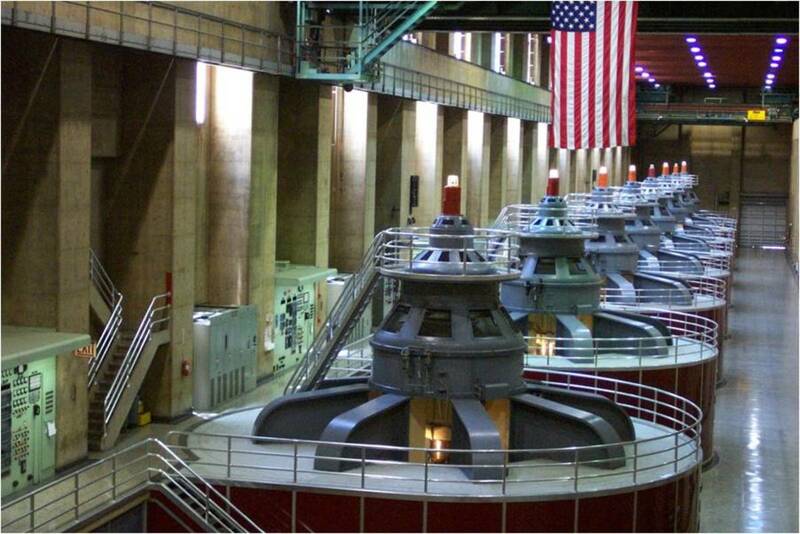 On a single-battery system turn the lights on for 30 seconds to 1 minute. 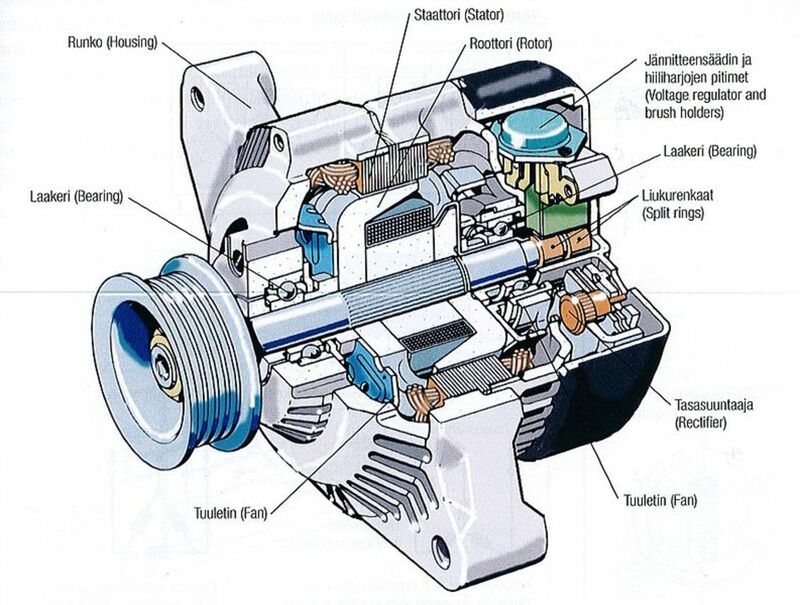 On a four-battery system, crank the engine for 10 seconds without starting the engine. 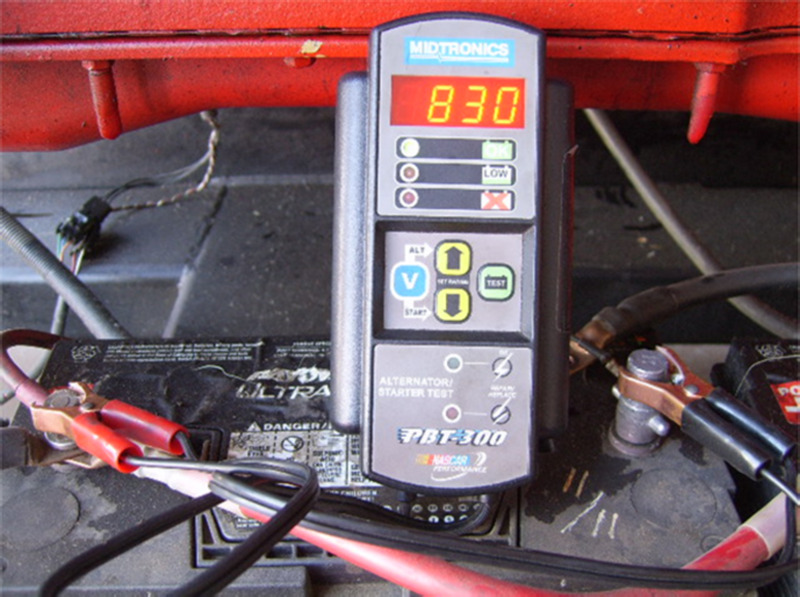 Place a voltmeter across the battery terminals with red on positive. Observe the reading and compare it to the specifications below. Note: The battery must be at 75% charge for further testing. Service Tip: If the vehicle just drove in and the battery voltage is below 12.4V, a charging system problem may be indicated. Voltmeter on DC Volts. Measure across the battery terminals. VAT Battery Load Test Hookup. A battery load test, as its name implies, is going to put a load on the battery. The load will lower the battery voltage and will be evaluated against a specification. In order to perform the battery load test and get good results, the battery must be at at least 75% of charge (12.4V) or more. To perform the test you will need a VAT (Voltage Amperage Tester) and a stopwatch. Many VAT machines have a timer built in. 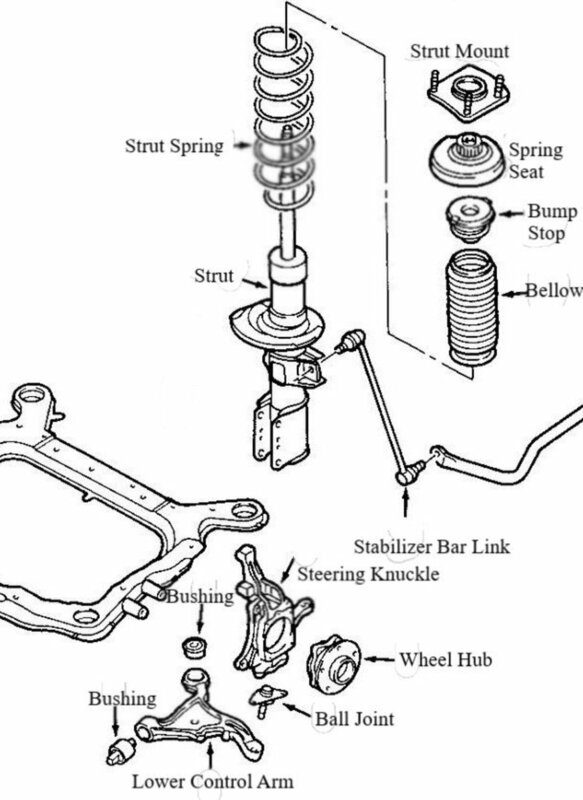 On stud terminals a test stud adapter should be used to obtain a better contact. Hook the VAT machine to the battery using the heavy leads, positive to positive and negative to negative. Hook the inductive lead around one of the machine heavy cables, using the direction indicated by the manufacturer. The inductive lead will pick up the magnetic field generated by the current flow and turn it into an amperage reading. Divide the CCA in half as this will be the amount of load placed on the battery. Depending on the machine, program in, or crank the load knob, until ½ the CCA is reached and hold it there for 15 seconds. This sends amperage thru a carbon pile in the machine. A lot of heat is generated, so let the machine cool down between load tests. At the end of 15 seconds record the reading. A good battery should remain above 9.6 Volts at 70°F or above. 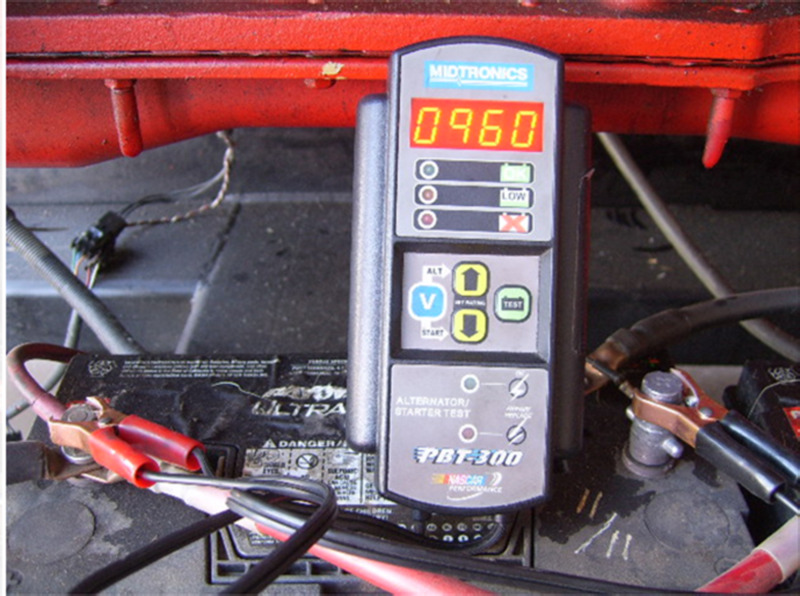 Service Tip: Some manufacturers have a higher specification of 10.2 Volts after 15 seconds for their vehicles. Most manufacturers do not recommend doing load tests on batteries at all. Performing a load test on a warranty battery may void the warranty. Dirt, acid and moisture can make an electrical connection between the battery posts that drains charge from the battery. To test, place one meter lead on a battery post and drag the other around the top of the battery. 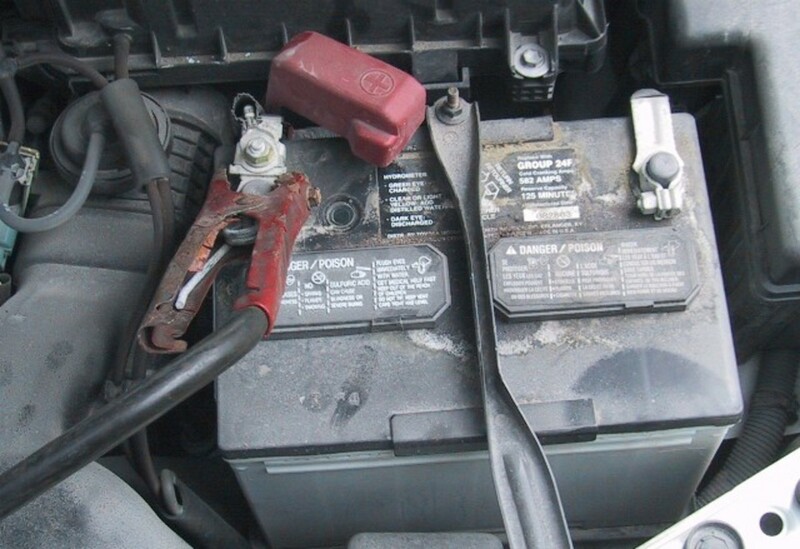 If voltage is found, the battery needs to be cleaned as previously outlined. On most vehicles today, there is a certain amount of current draw when the key and everything else is off. This is a normal occurrence, since the computers on board require a small amount of current to stay alive. A problem can occur, however, if something is on and drawing an excessive amount of current. This could run the batteries down over a period of time. The typical complaint is that the batteries are low after three or four days; if the vehicle is run every day the problem will probably not show up. 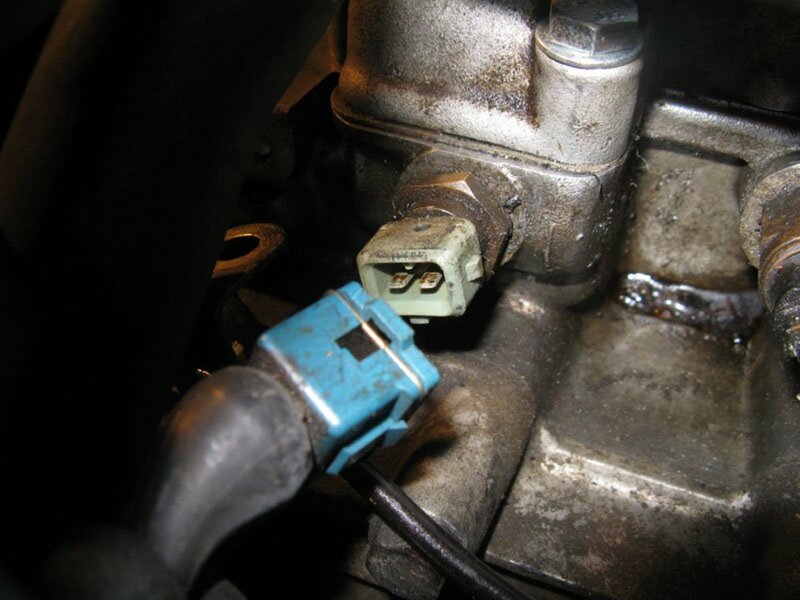 The typical situation that causes this is a light being left on, or, on an emergency vehicle, radios drawing current when they are supposed to be off. Turn everything off. Do not open the doors or turn anything on during the test. Disconnect the batteries so the only positive or negative connection goes thru a jumper wire. The meter should be on the 10A milliamp scale. Connect your ammeter to the battery post and to the jumper wire. Unhook the jumper wire so your ammeter is the jumper. All the amperage to the vehicle is now going thru the meter. If the reading is excessive, start removing fuses to isolate the circuit. 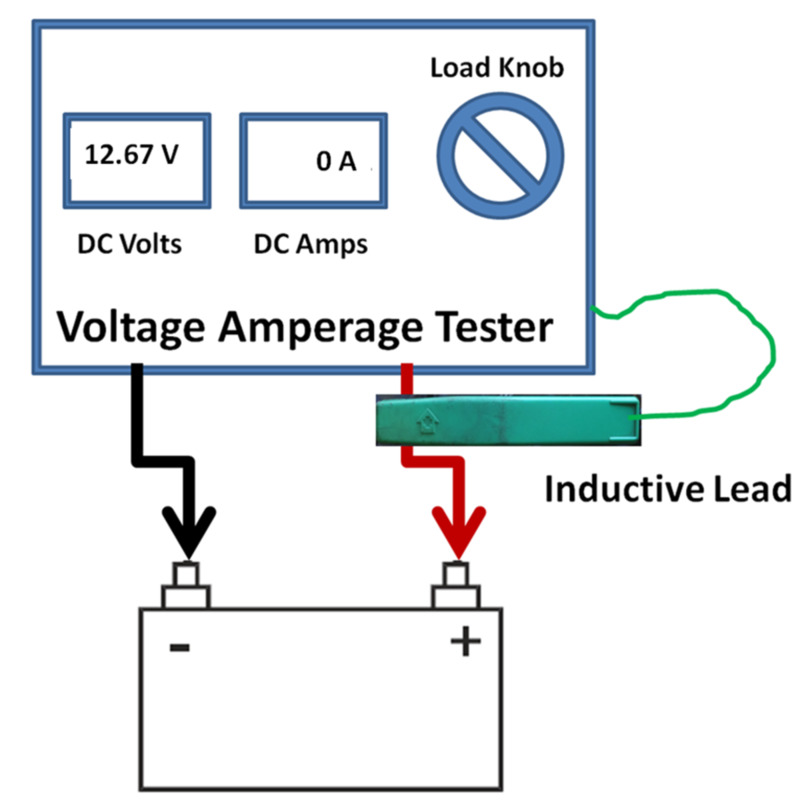 A Small Amperage Inductive Clamp is available to measure the milliamp flow without needing to disconnect the cables. This is a much easier method of measuring a parasitic Amperage draw. Thanks. Many times the battery life can be shortened by something as simple as dirty connections or battery. Performing the simple cleaning and maintenance can make your vehicle last longer. I'm glad you found a good shop to take care of you. This is a great hub! I recently had to have my car battery replaced. The service was really quick and professional, but more expensive than I had hoped. I'm always torn when it comes to auto repair--I tend to want to take care of things myself, but I'm not very knowledgeable about cars. I usually leave it to a trusted professional.